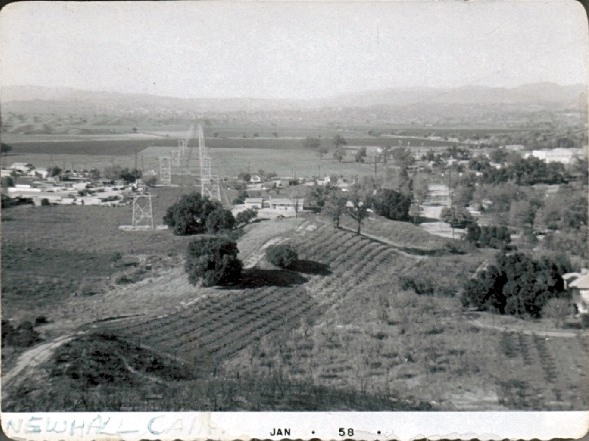 Happy Valley, looking north toward the future Valencia in January 1958. The house in the middle is the home of the photographer, Donald W. Gaskill, at 24601 Wayman Street, built in 1957. The dirt road, right of center, is Wayman Street. The stadium lights at H.M. Newhall Park (1950) are visible in the distance. The Hart High School gymnasium and/or auditorium is visible at the right edge. The farmland in the top half of the photo would later become the first Valencia housing tracts and, in the distance, the Valencia Town Center regional mall. Gaskill's son, Michael Gaskill, says his father shot the photo shortly after the family moved into their Newhall house, where Michael lived for 36 years before moving to Terrebonne, Ore.